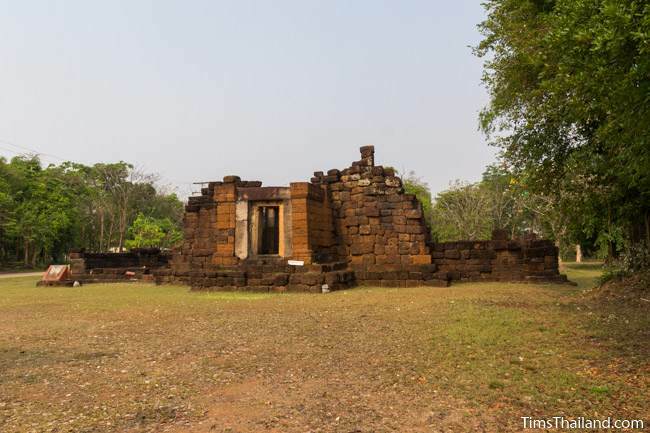 Prang Ku Ban Nong Faek (ปรางค์กู่บ้านหนองแฝก) was built by King Jayavarman VII (r. 1181-1219) as a Mahayana Buddhist temple for one of the 102 hospitals (arogayasala) he opened across the empire. 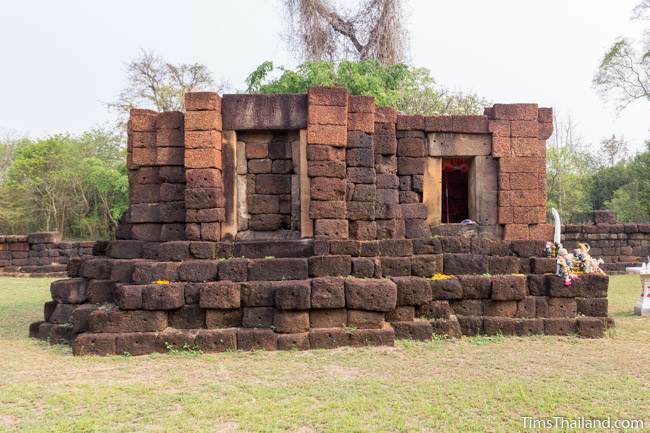 All of the structures – the main sanctuary, gopura, library, and enclosure – are built of laterite, with only door and window frames being of sandstone. 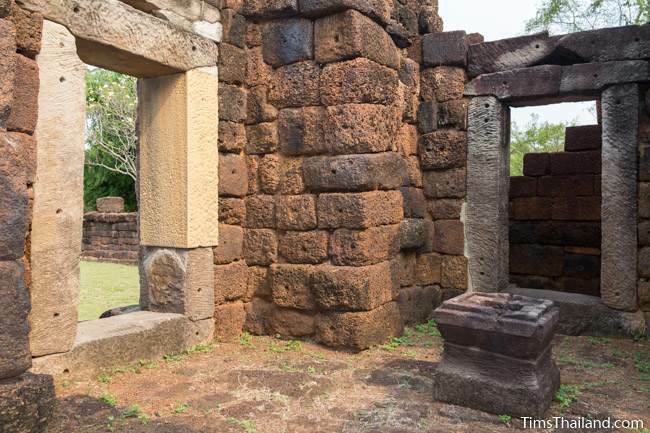 While none of the structures are complete and the tower is gone, after a recent restoration there's enough standing to make a visit enjoyable. 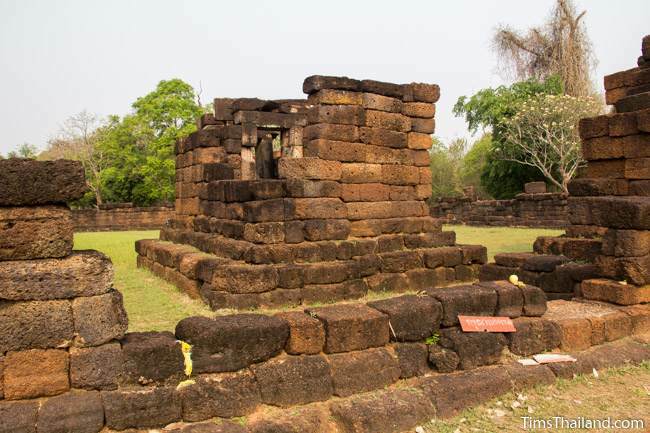 The only original entrance is through the gopura in the east (front) wall of the enclosure; though locals have made a small opening just to the south of the gopura for easier access. 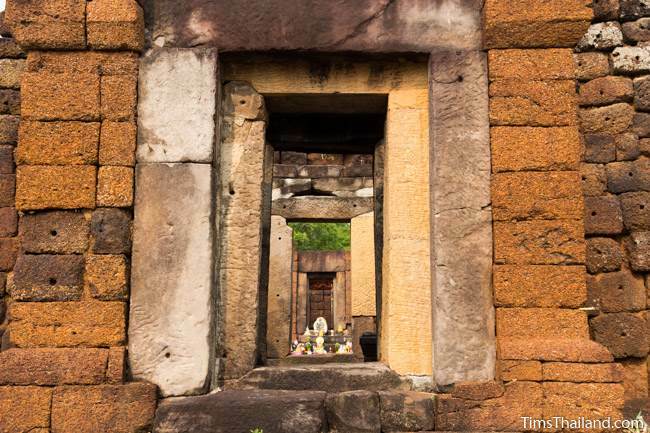 The gopura has a large main room and two tiny side chambers. There's a lone pedestal inside. Between the sanctuary and the gopura is the "library." The sign says "Danger, be careful of falling rock," but things appear safe. 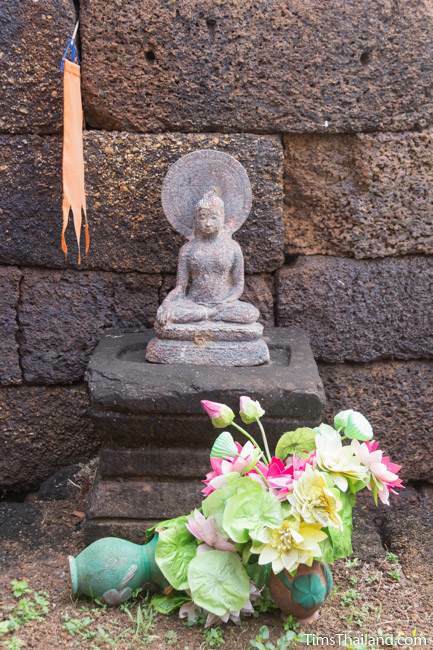 Inside is a modern stone-carved Buddha on an original Khmer pedestal. The main sanctuary is quite small. 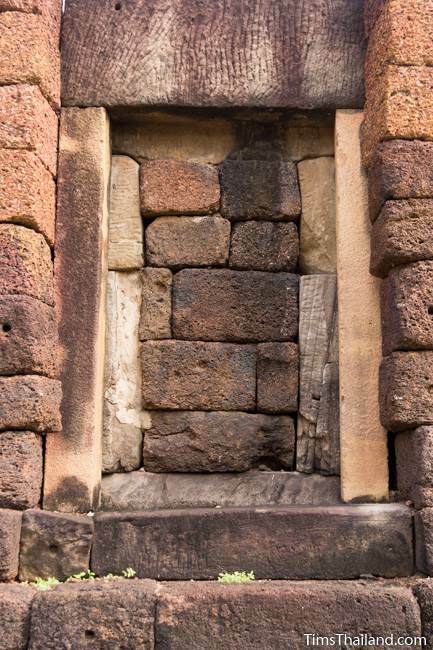 The side and back doorways were open in the Khmer era, but now have been filled in with laterite blocks, making what you could call "false false doors." 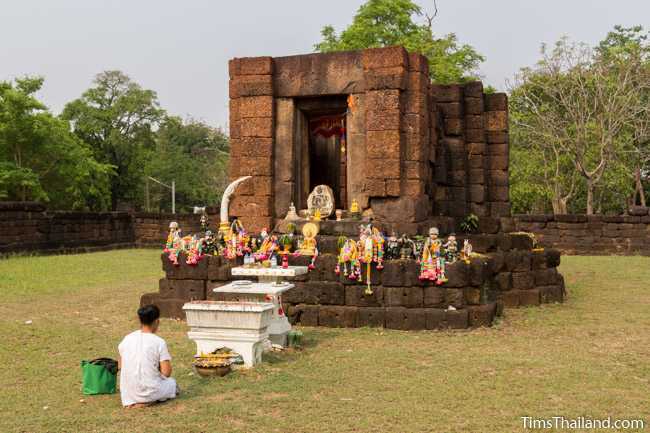 Nowadays offerings are made at the front door, which is not filled in, but is blocked by all the modern statues. 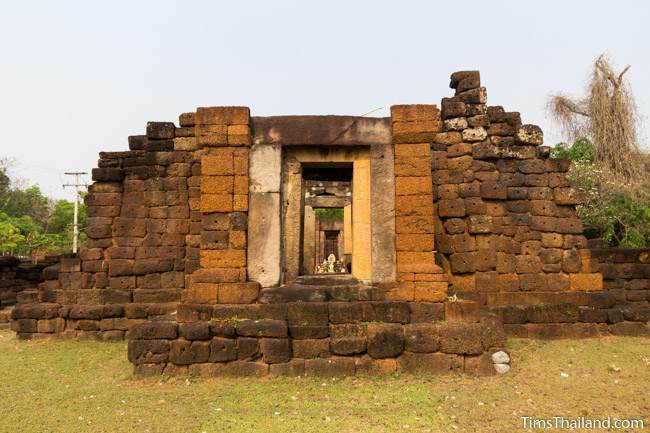 So, now people enter through the lone window on the south side of the mandapa. 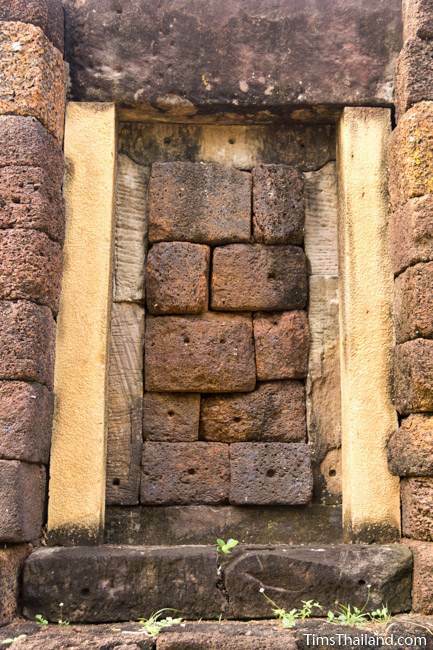 An original stone lintel slab over one of the sanctuary's false door is blank. 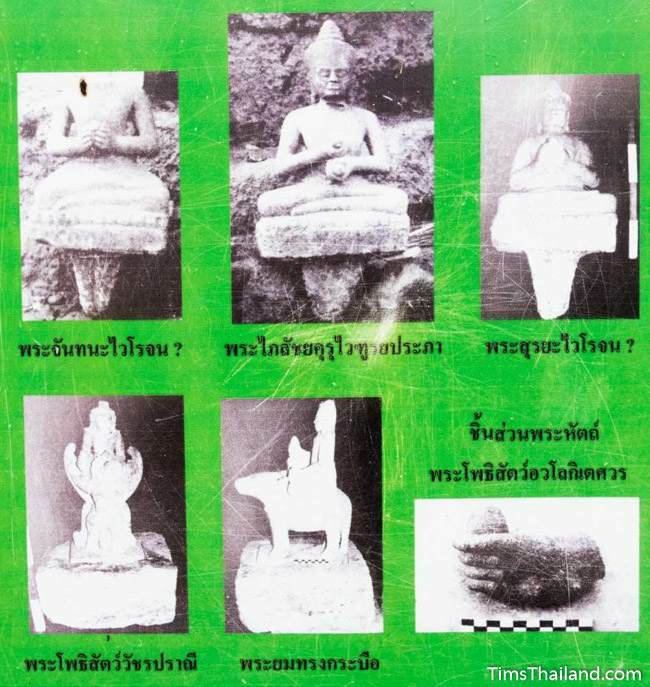 This, along with the prang's unfinished lotus-bud crown (on display in the back), indicates that the temple was never finished. 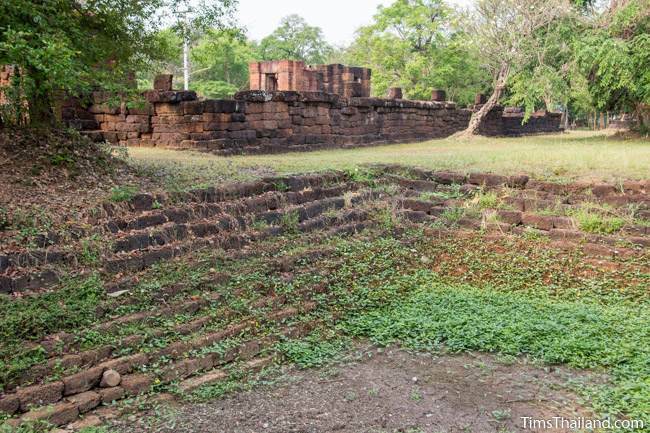 Though there are no carvings on the sanctuary or the other buildings, several original Bodhisattva and other Mahayana Buddhist statues (including Avalokitesvara, the "Buddha of Compassion," and Yama, the Lord of Death, riding a buffalo) were recovered here. 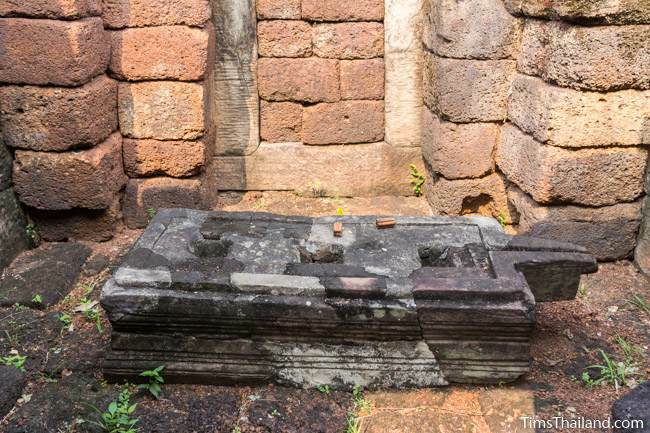 A large triple pedestal inside the sanctuary would have held three of them. 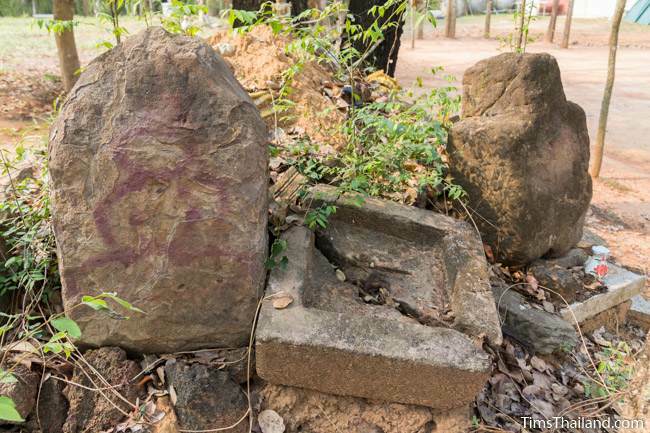 They were removed for safekeeping by the Fine Arts Department, but you can see pictures on one of the green historical signs next to the temple. There are several things to see outside the enclosure too. 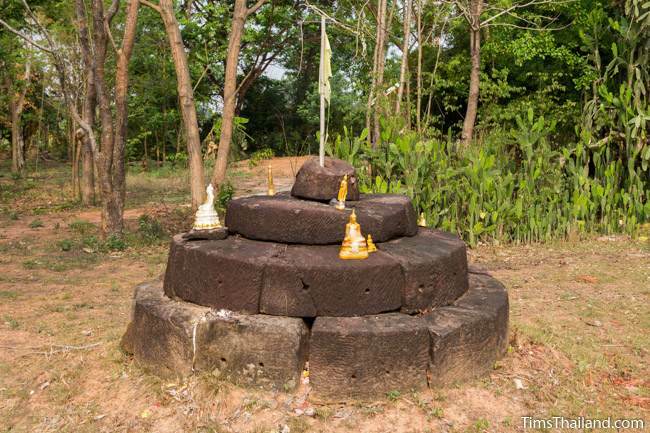 Besides the aforementioned lotus-bud top for the prang, there's a laterite-lined pond to the northeast. 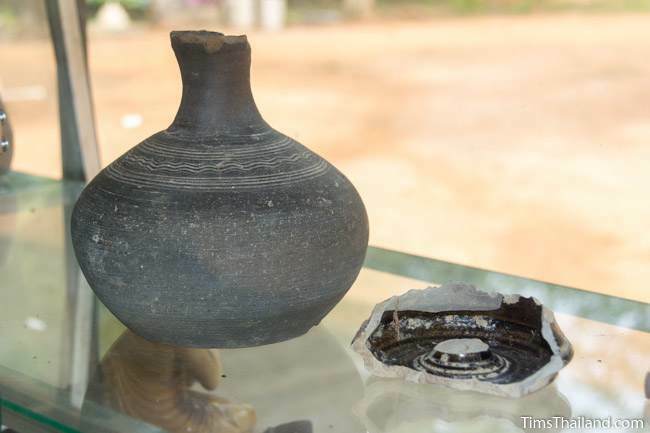 At the back, in the modern temple area, a dirty glass case at the front of a little sala holds a few pieces of Khmer pottery and other artifacts, and under a nearby tree is a small broken pedestal and some sandstone that looks like it was going to be carved into statues. 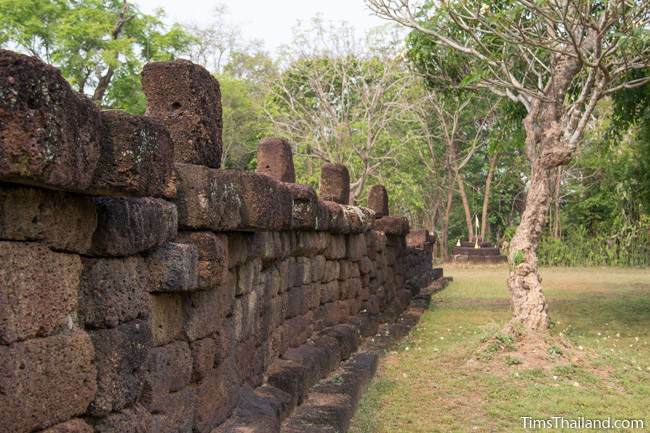 There's no trace of a moat or baray. 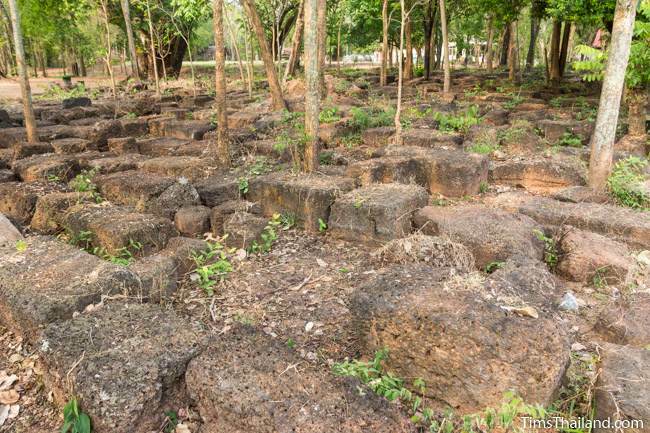 A lot of new laterite was used in the restoration, which is kind of odd when you see the hundreds of old laterite blocks laying around the temple (both to the north and the south). This also makes you wish the Fine Arts Department had had additional time to do a more complete restoration, but considering how few people visit here, it's understandable to just do what they did. 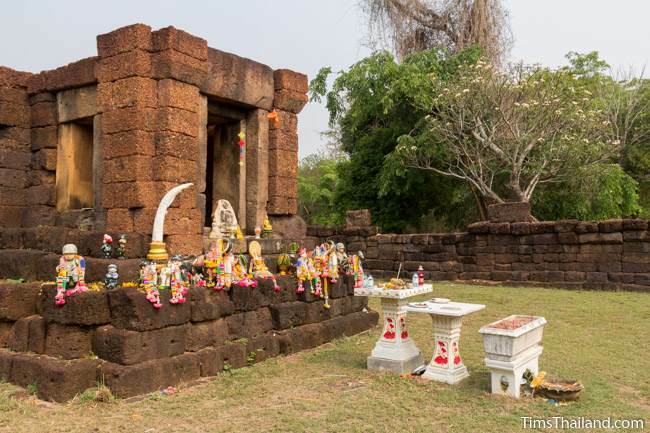 Please note that Prang Ku Ban Nong Faek is a very important holy site for locals and they have two special rules for all visitors, whether merit makers or tourists. 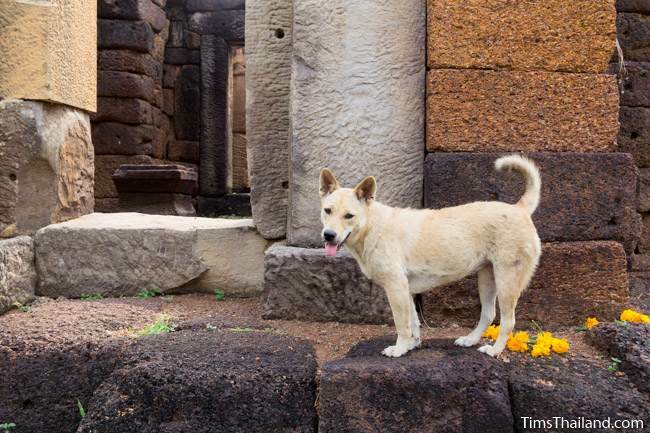 Shoes are not to be worn anywhere inside the entire complex and women wearing dresses or skirts cannot go inside the main sanctuary. There are no signs in English explaining this.